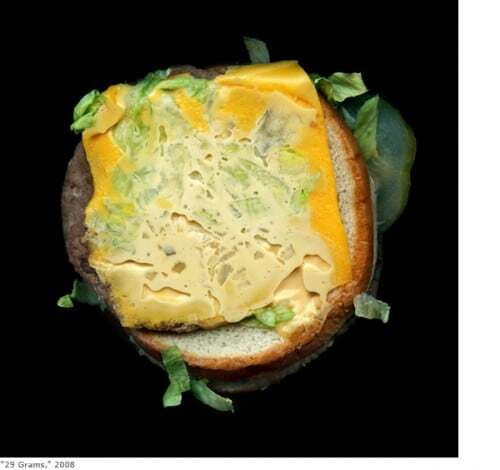 I just came across this repulsive-yet-captivating series of Fast Food photographs by Jon Feinstein. Each image is named for the quantity of fat the food contains. Since the 1950’s fast food has become so global that its icons are often as recognizable as popular historical figures — its image heavily branded into the public periphery. “Fast Food” is a typological exploration of the food on its own. Hamburgers, French fries, chicken nuggets, and “specialty” sandwiches are presented on stark black background, isolated from their common context, without name recognition, nearly floating in space. Under austere, uniform lighting; stripped of logos, packaging and iconography, the food takes on a disgustingly, and scientific, yet ethereal quality. These photographs investigate the love/hate relationship that many Americans have with fast food and, like many other aspects of popular culture, its ability to be simultaneously seductive and repulsive.